Our tables are sold out, but bar seating is still available! 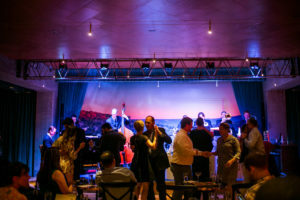 Bar Seating - Buy Tickets Here Valentine's Day (6:00 Show - Dinner Included) Join us for an unforgettable evening at Jazz, TX with Doc Watkins and his Orchestra, performing classic arrangements by Sinatra, Ellington, Basie, and more. The show begins at 6:00, and..
Our tables are sold out, but bar seating is still available! Bar Seating - Buy Tickets Here Valentine's Day (9:00 show - Dinner Included) Join us for an unforgettable evening at Jazz, TX with Doc Watkins and his Orchestra, performing classic arrangements by Sinatra, Ellington, Basie, and more. The show begins at 9:00, and..